So, with the intro out of the way, let’s start with one of the most iconic of GW’s factions, the warriors of Chaos! In Today’s Unseen Influences we are going to look at the early work of the British fantasy author Michael Moorcock. Michael Moorcock is regarded as one of the greatest living fantasy writers, and his books tend to cross genres today, but back in the 1970s and 1980s when the GW studio was young he was known mainly for one character: the cursed albino wanderer Elric, the Eternal Champion. The universe of Elric is, like Tolkien’s Middle Earth and Robert E. Howard’s Hyboria, meant to be our earth in another age. In Moorcock’s cosmology there are two eternal forces at war in the universe: Law and Chaos. Between them is the Balance, and each of these forces is served by champions and heroes. The more Chaos in a world the more magic, and the more Law the more phenomena conform to observable laws. So our time is a Law heavy age, as we have working physics and no (or very little) magic. Elric starts out as a champion of Chaos, and on his earth magic and Chaos dominate. Elric was himself originally conceived by Moorcock as the anti-Conan. 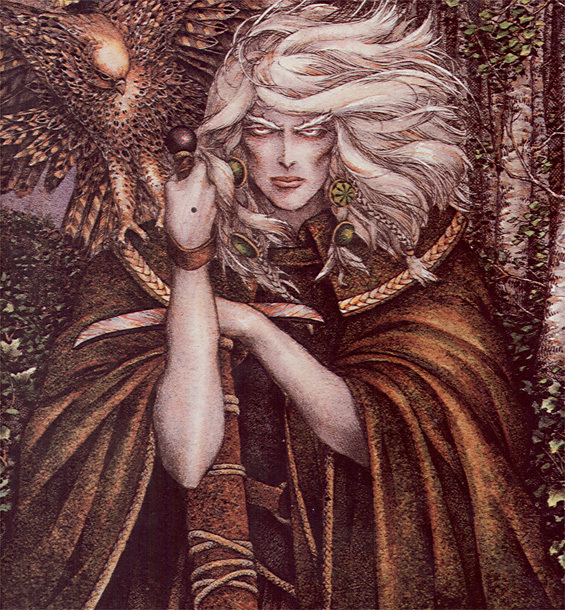 Instead of being a barbaric and virile warrior, Elric is a weak albino from a decadent culture of effete wizards. The symbol of Chaos in Moorcock’s mythos is the eight pointed star, representing all possibilities and potentialities. Towards the end of Stormbringer, the final of the original Elric novels, a vast Chaos horde threatens to overthrow life on earth completely. Everywhere they go, mutation and corruption are rife. The Chaos army is a great tide of demons, mutants, sorcerers and armoured warriors, brimming with the power of Chaos. Their flagship is a huge magically floating galley with a massive eight pointed star on its sail. Sound familiar? Stormbringer was written in 1965, and so definitely predates the GW Studio. Not only that, it is very likely that Rick Priestley and the others read Moorcock, as he was the best known pulp fantasy writer in the UK at that time. Today, the star of Chaos is an iconic Games Workshop image, and the idea of a Chaos champion is much more likely to bring to mind GW’s work than Moorcock’s for the average sci-fi or fantasy fan. Next time I’ll talk a little bit about Frank Herbert’s Dune and its often overlooked influence on 40k lore. This entry was posted on Saturday, March 5th, 2011 at 2:35 pm	and tagged with Chaos, Elric, fluff, Inspiration, Lore, Michael Moorcock, Stormbringer, Warhammer and posted in Unseen Influences, Warhammer 40,000, Warhammer Fantasy. You can follow any responses to this entry through the RSS 2.0 feed. This is a very interesting link of which I was completely unaware. In fact, I am ashamed to admit that I only ever knew of Elric from a small comic series from about 20 years ago. Man, I would love to know where those comics are now. I’ve always heard of Moorcock, but haven’t read much of him. I think I would like to pick up some of his stuff. Thank you for the review. I look forward to more, and possibly you sheading some light on Dune that I didn’t already know. B. Smoove, there are new Elric comics at the moment (published by Dark Horse I think), I didn’t know they had them back in the 80s too! They would be cool to get hold of. He also had a huge influence on the High Elves – in fact GW held a license to produce Elric miniatures, the bulk of which was assimilated into the early High Elf range when they lost the license. That’s true David, the High Elves share a lot with the Melniboneans, Elric’s dying sorcerous people. I was thinking of mentioning that but I didn’t want to write a whole essay so thanks for bringing it up! Whoah, that just sparked the dimmest childhood memory of seeing the Eternal Champion boxed set in a Citadel catalogue when I was a kid. I’d cmpletely forgotten. As for the Conan thing, I didn’t make it up – my little brother told me! Seriously though, it seems the He-Man/Conan connection is a persistent myth. Now that blew my mind. That is more information about toys than any man should be subjected to. Ever! I read much of Moorcock’s work a good 20 years after it was written but well before GW absorbed the concepts. I am a recent wargamer (old guy, new hobby) and it’s nice to see that some people understand what a wonderful aggregate of various fiction it is. One of the things I love about blogging is that the conversation is never over. Threadomancy is not a crime! The Melniboneans are more subtle, they just summon demons for fun to keep themselves amused, and they treat humans like cattle. It’s as if GW swiped the Melnibonean surface features (names, look, etc) and pasted them onto good guys. Personally I find the Wood Elves the most interesting of the GW elves. Maybe my next Unseen Influences will be on them? I think the second edition of Warhammer started with a dedication to “Michael Moorcock, Phil Barker and Donald Featherstone, who’s fault this all is”. I stumbled on Michael Moorcock in a library in the Arctic, having heard him mentioned by Hawkwind. The influence on the Warhammer world is striking. Great post. I got into Moorcock seeing it mentioned in either D&D or dragon warriors. I always thought the early eldar models were very much based on the citadel melnibonian miniatures, as well as the dying powerfull magical race bit from the fluff.